The 2017 legislative session kicked off today in Des Moines. Our chance to save unborn life starts now! As you remember, the results of the 2016 elections here in Iowa mean that we have our best chance in years to stop abortion here in Iowa. That’s because committed pro-abort legislators like Mike Gronstal, Steve Sodders, Brian Schoenjahn and more were removed from office by pro-life voters like you and me. Enough pro-abort legislators lost their bid for re-election that we flipped the Iowa Senate and placed it into the hands of the Republican Party. This means that we have a pro-life majority here in Iowa for the first time since the late 90’s! That’s why it’s vital we act immediately, to secure pro-life legislation now, while we have the chance. Shortly we’ll be re-introducing our Life-at-Conception legislation as well as working on legislation to defund Planned Parenthood here in Iowa. We are not looking to manage or regulate the abortion issue here in Iowa — we want to end it, and we know you do too. That’s why it’s time to push for Life-at-Conception legislation right now! We’ll have much more information coming forth shortly, and we’ll be counting on your assistance all session long. 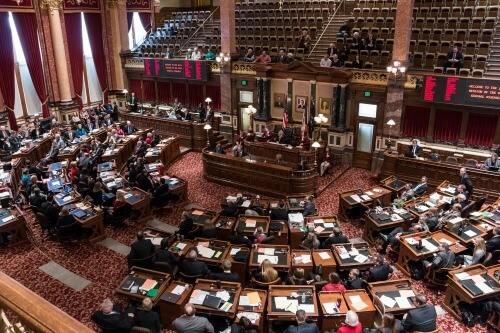 While it should be easy to advance major pro-life reforms having flipped the Iowa Senate, it simply won’t. Planned Parenthood will spend a fortune trying to stop this legislation, and their pals in the media will be backing them up all the way. So please make your voice heard, by signing your petition in support of Life-at-Conception legislation right away! We need to gather as many signed petitions as possible to make this legislation move forward. In addition to your signed petition, I hope you’ll consider renewing your support in Iowa Pro-Life Action for 2017. Your financial gift will help us get the word out to more pro-lifers about our legislation to end abortion here in Iowa, to make sure they are calling their legislators when it counts! That’s why I hope that as we prepare for this legislative fight you’ll also renew your support for Iowa Pro-Life Action. Thank you for standing up for the unborn. The next few months will be critical in stopping abortion here in Iowa. P.S. The 2017 legislative session kicked off today. After years of seeing Life-at-Conception legislation being stopped by Mike Gronstal, Steve Sodders, and others in the Senate — they were all removed from office by pro-life voters! Now’s the time to pass Life-at-Conception legislation, while we have such large majorities. If we don’t do this now, when will we? And when you’re finished, please renew your support in Iowa Pro-Life Action! Your financial gift will enable us to get the word out to as many pro-lifers as possible here in Iowa.